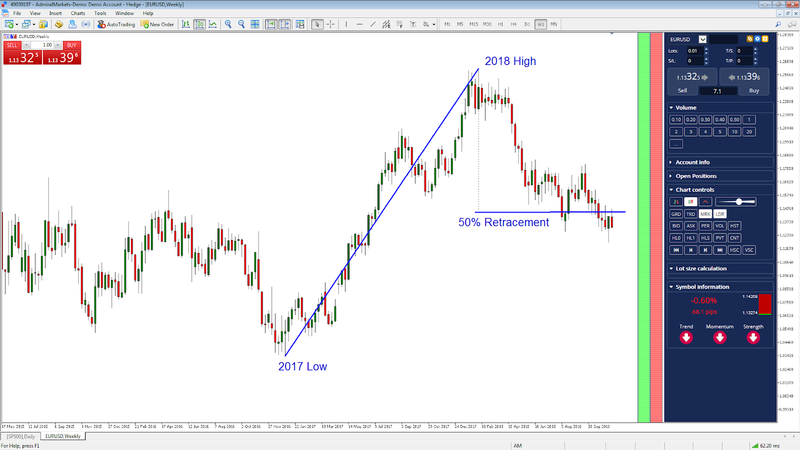 Could the EUR/USD hit $1 in 2019? 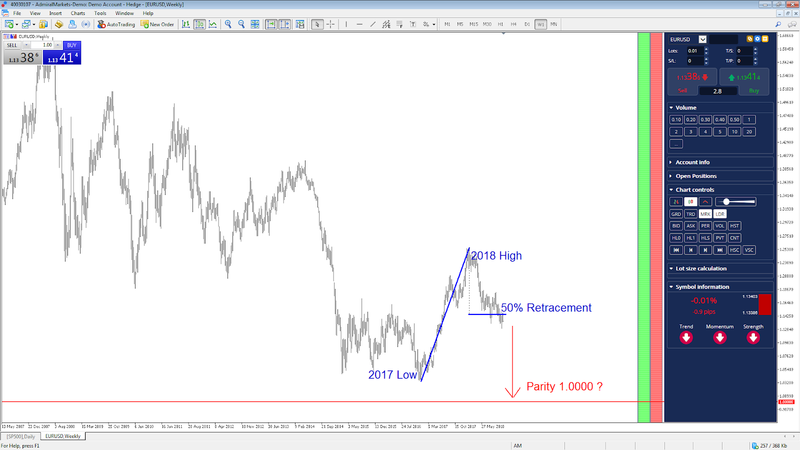 Will the EUR/USD hit $1 in 2019? The Euro-Dollar currency pair experienced a meteoric rise in 2017, posting a 20% gain from its lowest price in 2017 to its highest price in 2018. Why? Largely because the European Central Bank announced a cut to the stimulus programme it set up following the financial crisis. However, in November 2018 the EUR/USD forex pair retraced 50% of the year-long move higher. Buyers bailed on their long positions in favour of the US dollar thanks to the US Federal Reserve’s path of increasing interest rates. Now that the market has retraced half of the EUR/USD trend higher, traders are questioning what will come next for the currency pair. When trading the EUR/USD, we need to look at the facts, so let’s discuss the Euro-Dollar news, whether or not the currency could fall to parity, and how you can prepare for EUR/USD trading in 2019 from today. For those considering trading the euro/dollar to parity, it means taking a bearish view on the European economy and a bullish view on the US economy until €1 equals $1. How can we do this? By analysing the US dollar’s and Euro’s respective economies and central bank policy actions. The US Federal Reserve members painted a very bullish picture on the US economy in November’s FOMC meeting. It seems like the US economy is firing on all cylinders with the labor market, a strong gauge of economic health, strengthening at a rapid pace. With wages also going up at the quickest pace in almost a decade, US Federal Reserve Chairman Jerome Powell has committed to tighter monetary policy by increasing interest rates. The Fed has already increased interest rates eight times, with another jump expected at the end of 2018, or in early 2019. This path of increasing interest rates has, so far, kept US dollar bulls in the market with their open positions. The European Central Bank has not increased interest rates since 2011, as structural problems within the Eurozone countries remain. This has largely kept the Euro depressed. However, when the European Central Bank announced they would halve their stimulus programme, known as quantitative easing, the EUR/USD trend rallied to a 20% gain from its low in 2017 to its high in 2018. The market had been expecting the ECB to fully withdraw their stimulus between the end of 2018 and middle of 2019, with a view that the bank would finally start to increase interest rates at the end of 2019. However, due to a Eurozone slump, traders have been bailing on the currency. The Italian crisis is still an issue with a defiant Italian government testing the resolve of the ECB regarding Italy’s budget. The European Commission rejected Italy’s budget plans for 2019, and investors fear the situation could worsen. This has weighed on the Euro currency and is just one reason the EUR/USD trend has fallen 50% lower from its previous year long move higher. How Will You be Trading the Euro Dollar Pair? Generally speaking, the fundamental picture looks weak for the Euro and strong for the US dollar. However, this could change as changes in economic data influence central bank policy actions. That’s why many traders will want to know the best EUR/USD trading strategies for the currency pairing. So what is the best way to start trading the Euro Dollar CFD and how should you start preparing for 2019? When it comes to EUR/USD trading, having the right knowledge and skills is essential to capitalise on the ideas and research outlined above. Picking the right direction is just one part of the process. Other factors like timing and risk management are also essential. After all, not every trade will go in your favour – are you prepared to manage that? Whether you are a beginner wanting to get into the game, or a trader who wants to improve their game, the Forex 101 trading course can help. With 2019 shaping up to be a big year in the currency markets, how are you preparing for it? Source: Could the EUR/USD hit $1 in 2019?